You've only got one spine. Take great care of with supportive chiropractic care. Welcome to the official website for Skocik Chiropractic, offering Harrisburg health and wellness services for the entire family. We combine cutting-edge technologies with hands-on natural care to diagnose and treat an enormous range of physical problems and health conditions. We can also serve as your preventative wellness provider by keeping you and your loved ones health without surgery or drugs. Our chiropractor, Dr. Albert Skocik, is in his third decade of providing top-quality health and wellness care for the Harrisburg community and surrounding area, treating more than 16,000 patients since 1989. Dr. Skocik possesses advanced training in chiropractic rehabilitation, applied kinesiology, cervical injury treatment and other specialized services and techniques. Chiropractic adjustments involve applying specific degrees of thrust to joints that are suffering from subluxation (misalignment). 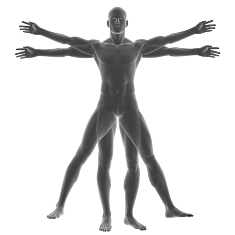 Manipulating the joints restores their proper alignment, permitting the body to operate normally once again. Our Harrisburg chiropractor can prescribe a mix of chiropractic care,massage therapy, THOR laser therapy and various forms of physiotherapy to help you keep pain and inflammation under control the natural way. An auto accident injury can cause whiplash, sciatica, seat belt injuries, shoulder injuries and other musculoskeletal agonies. We can prescribe a healing and pain relief regimen to help you recover. If you've sustained a neurological or musculoskeletal work injury, we will perform the necessary treatments and rehabilitation while processing your claim documentation with utmost accuracy and thoroughness. Spinal decompression is a means of applying flexion distraction force to the spine to help bulging or herniated discs relocate themselves in their proper position -- relieve their pressure on neighboring nerve roots. Our massage therapy soothes painful muscles, relieves swelling, relaxes muscle knots and enhances the body's healing abilities. Periodic spinal screenings, adjustments and other wellness procedures and safeguard your entire family's health for life. Nutrition plays a key role in restoring and maintaining wellness. We offer nutritional counseling and Metagenix supplementation to improve your health and speed healing. If you suffer from diabetic, sensory, peripheral or other neuropathy, turn to Skocik Chiropractic for help. We can utilize several natural techniques to relieve nerve pain and other discomforts. THOR laser therapy uses a low-level laser to create a photochemical reaction in cells, accelerating tissue healing while relieving pain, swelling and inflammation. to set up an initial consultation with our chiropractor!